Wuertz Farm is noted for growing gourds of all shapes and sizes. But come February, Wuertz Farm hosts a big Gourd Festival in Casa Grande, Arizona. Each February gourd enthusiasts and families just out for a good time, head for the Gourd Festival at the Pinal County Fairgrounds. Entry is $6.00 per person. No charge for parking. Over 100 gourd artists and vendors will display their wares. In addition, there will be food and entertainment for the whole family. As we left the gourd judging building we had built up a bit of hunger. We read the signs over the carnival foods for pulled pork, "hog on a log," corn dogs, etc. and decided that the vegetarians in our group needed something a bit different. Fortunately the beer garden served quesadillas. We enjoyed a shady meal and were well-fortified to move on to the next large building passing by the outdoor stage where the Hawaiian dancers were getting ready to perform. 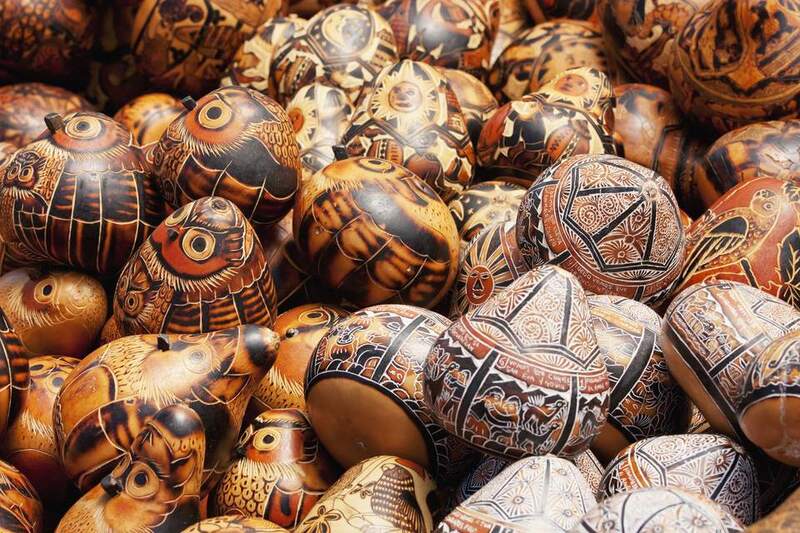 It was the art gourds that captivated us. We enjoyed talking to the artists and found, much to our surprise, that their art was much more affordable than in the gallery setting. I purchased a beautiful wild horse themed gourd designed by Kristy Dial of Gecko Gourds. She is skilled at capturing the spirit of the Southwest in her gourds. After over an hour of perusing booths, my friends were drawn to the art of Phyllis Sickles of Tucson. Phyllis taught art in New Jersey and has perfected the art of gourd carving and painting to the point of attracting a crowd around her booth. Her beautiful work is sold in the Cobalt Fine Arts Gallery" in Tubac. Most noteworthy of her offerings at the festival was a carved buffalo gourd with details of turquoise. Featured on this work of art was the sacred white buffalo. This beauty found it's way into the personal collection of my friends from the Phoenix West Valley. The first thing that you will notice as you turn off I-10 to the Pinal County Fairgrounds is that you are no longer in the city. This is a rural, agricultural area. The Gourd Festival, hosted by the nearby Wuertz Gourd Farm, maintains the flavor of a rural festival while attracting some very skilled gourd artisans, some of whom exhibit in top art galleries in the Southwest. We parked and headed toward the gate, enjoyed the gourd flute music by Zach Farley of Patagonia, Arizona. We noticed a line of people outside one of the buildings. This was the building where the gourd judging had taken place. Of course we wanted to see all the entries so we joined the line and were serenaded by Los Primos, a band whose repertoire ranged from mariachi to jazz. Once inside the Arizona Gourd Society's gourd judging building we found out why there was a line. There was so much to see and visitors wanted to enjoy the detail and the creativity of each entry as well as photograph their favorites. As we moved from the novice category to the professional category, we gained an appreciation of the art of carving and painting the gourds. The vendor building was abuzz with activity. There were four rows of booths displaying gourd art equipment and supplies as well as beautiful decorated gourds for sale. We stopped at each booth and noticed that there was a wide range of art offered. There were the mom and pop decorated holiday gourds, bargain gourds from Peru as well as the top of the line art gourds, reminiscent of those you see in top galleries in Tubac and Scottsdale. As we strolled the festival grounds we enjoyed more gourd humor, petted a miniature horse with a gourd rider and photographed a gourd bicycle. Not to be missed is a visit to the Weurtz Gourd Farm booth where you can see the raw gourds and watch artists selecting gourds for their next works of art. I highly recommend the Wuertz Gourd Festival whether you are a gourd enthusiast or just would like to enjoy a day in the country. There is fun, food, entertainment and a variety of gourds that will amaze you. We left the festival filled with folksy gourd-humor and anticipating a relaxing evening listening to the gourd flute music CD and watching the Arizona clouds drift over the golf course.